She's Fantastic: The Girls of MYSTICONS! 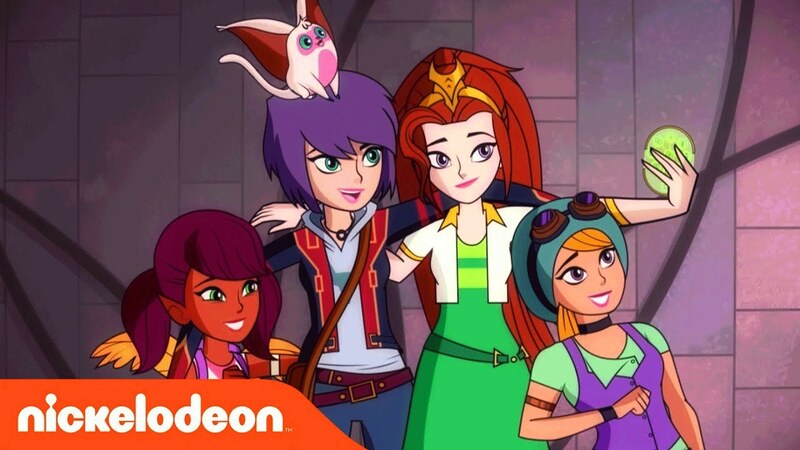 When I first read about Mysticons a few years ago, the proposed team consisted of boys, but then about two years ago I read an article and it was suddenly centered around four young girls. Then I soon heard that Playmates would be making toys and my excitement has been building ever since. The actual cartoon (which began airing on Nickelodeon in August) is not exactly my cup of tea. I'm just not the target demographic at all (but I'll give it another shot eventually). But these toys. These toys are perfect for me. Bright colors. Mythical themes. Not too cartoony. Fun translucent accessories. And best of all, amazing flying griffin steeds with battle armor! It's very rare to get a female character who rides an animal, let alone actual action figures of those characters and beasts. So yeah, this property thrills me and I hope it's successful enough to warrant many more toys. Queen Necrafa seems especially ripe for the action figure treatment. Time will tell. Let's check out the first round of basic Mysticons figures below! Zarya Moonwolf is a street orphan who has survived by her wits and nimble fingers. She's fiercely protective of other street kids, especially Piper. As Mysticon Ranger, Zarya comes with her magical bow and arrow and her wolf bracer. This Zarya figure is identical to the single pack version. The only difference is that the single version comes with her pet foz, Choko (in transparent blue). 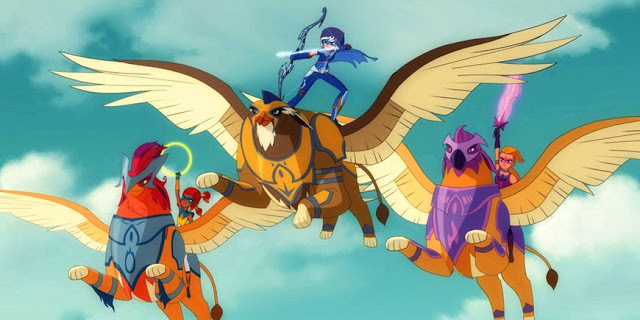 Griffins are the traditional battle mounts of the Mysticons. The only male griffin on the team, Archer is a descendant of the original Mysticons fleet. The Griffins have an action feature where if you move their tails up and down the wings will flap. The range of motion isn't super great (just a few inches) but it's a really cool feature. Archer comes with a lot of cool battle armor. Arkayna Goodfey is a smart, determined, and idealistic princess. She has some basic magic skills and loves riding her griffin, Izzie. Arkayna was chosen to be the Dragon Mage of the Mysticons and comes with her powerful Dragon Staff, dragon arm bracer, and a baby dragon. Her ponytail is articulated with a swivel. Each Mysticon has their own griffin that they ride. Arkayna has trained with Izzie for many years and can always count of her majestic friend to be there for her. Here's a shot of Izzie and Archer together. I love these beasts. The Griffin figure and single pack Arkayna figure are slightly different. I actually went back to the store and picked up a single pack because I preferred it. The major difference between the two figures is the hair. The Griffin version has a windblown ponytail (which you can see sticks out pretty far) and her coat tails are shorter. Piper Willowbrook is an optimistic, bubbly, young elf who is in constant motion. A parkour master, Piper pings off walls with ninjabatic skills—but she also loves music, glitter, and anything cute. As Mysticon Striker, she comes with energy hoop, a phoenix arm bracer, and a little plushie. Emerald "Em" Goldenbraid is a wise and courageous dwarf with a big heart. She's also the Royal Griffin wrangler and loves flying on her favorite steed, Topaz. As Mysticon Ranger, Em bears a powerful Star Sword and Shield. She also comes with her unicorn arm bracer and a baby griffin. The cardbacks show the Tazma figure which apparently is not being included in these first assortments. She's not listed on the Playmates website either, but she was shown at NY Toy Fair back in February. These figures all come with collector cards. I really hope Em and Piper's griffins get toys eventually, even if it means re-buying the figures. Here are the girls all together. I really appreciate their varying heights. And with two big contenders in the fledgling girls action figure market, DC Super Hero Girls, and WWE Superstars. Very cool figures. And yes, the armored griffins are awesome. Thanks for sharing. WOW!These are some sick looking figures!My niece would flip over these.Hell I like them ,too. Love Mysticons. Very fun show but I delayed watching more episodes due to my Horror movie marathon so, I'm very intimidated catching up. Action figures really look good too.